Take a walk through the town of Kurri Kurri and you will be pleasantly surprised to see several buildings and walls painted with beautiful murals. Kurri Kurri has over 50 outdoor public artworks on display. These murals depict the culture, lifestyle and history of the people and have gained international recognition. The project is undertaken by a small community group called Towns With Heart Inc. that work in several of the neighboring towns as well. 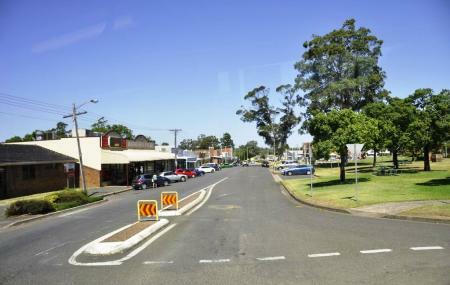 Guided walking tours are conducted daily for those visiting and more information regarding them can be obtained from the Kurri Kurri Visitor Center. Every Mural includes a 'Kookaburra', which is the symbol of Kurri Kurri, see if you can spot it. All guided tours must be booked in advance. Guided tours are conducted daily. Tours without meals are 1 ½ hours and tours with meals last for 2 ½ hours. Guided Walking Tour costs $5.00 AUD/person; Meal & Guided Tour costs $20.00 AUD/person (includes guide, lunch & coffee). Kurri Kurri Visitor Information Centre- 9.00 am to 2.00 pm daily. Bus Stop: Rotary Park Hampden St on Bus No. 160, 163, 164, 166, 171, 172. How popular is Kurri Kurri Murals? People normally club together Merewether Baths and Werakata National Park while planning their visit to Kurri Kurri Murals. Getting busier each year. Great stalls and music. Shame in such a small dying town that all the businesses do not choose to open on the town's busiest weekend.